In this lesson we will discuss about Google Plus social networking site. Google Plus is social site backed by Google. How to use Google Plus for your website? Google Plus is backed by Google. So we can not deny importance of it on Search Ranking. Though it has lost its shine from days of launch. There is not much push nowadays. Due to very nature of Google Plus it is more beneficial to Search Ranking compared to other social media sites. Why Google Plus is beneficial for SEO? By end of this article you will establish presence of your website on Google Plus. Without using heavy words and making it too complicated I will try to make it a easy to follow practical tutorial. Google Plus has one unique property which differentiates it from other Social networking sites like Facebook and Twitter. Anything shared on Google plus is viewed as an endorsement. Google has visibility of the action on Google Plus. It knows which links you have shared or voted for. This information is used by Google to filter your search results if you are logged into your Google account while searching. Most of us remain logged into our Google account while searching. So if you have endorsed links from a particular website then Google ranks that website higher in the search results. This improvement in search ranking is direct benefit of Google Plus. For personalized search results Google relies on other factors as well like CTR of a particular website on search results page. But for sake of simplicity we will not discuss other factors in details. Apart from this Google does use your Google plus follower count to establish authority of your website. Later we will see that you can associate your websites in your Google Plus account. Good number of followers is good for your brand image in eyes of Google. This brand image will be beneficial for all websites you have associated with your profile. Google Plus account creation is very simple. You can log into Google Plus account using Gmail. By default Google sets up your account. You can use email id associated with your website to create account. Open this link in browser and log with your Gmail id associated with website. 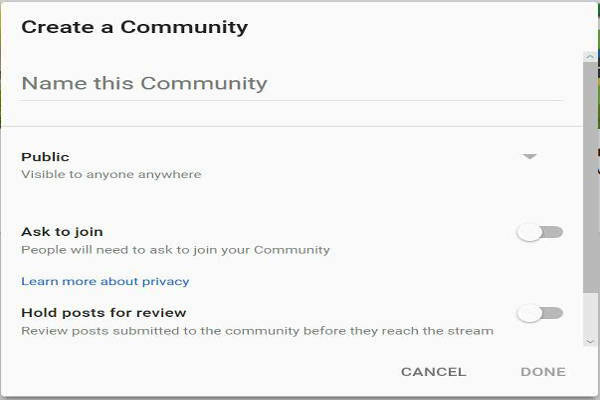 Enter name of your community. You can make it same as your website name. You can make it Public community so that every one can join and contribute. But you can make it private if you want only website members to access it. Once you have created your community you can direct your followers to this newly formed community. You can start sharing content on this community. Now second step is to become member of communities related to your website niche. This will help you promote your content as well as get new content ideas. You can engage with others with similar interest as yours and build a group of yours. There is no need to join too many communities. You can select few to start with and see how things go. You can track if the community is interactive and responsive to contents shared. It is better to join community with less population but more interactive than a less interactive over populated community. You can enter short description about yourself and link to your website and social media profiles. From the About Me description section you can also link to your website About Me page. Below is screen shot of my About Me page. Notice the links in description part and also the links to my website and profile. So far we have discussed things you should do on Google plus social media network. Once your profile is set on the social media platform it is time to focus on your website. You should tell visitors about your presence on Google plus. Google offers different widgets that you can add on your website. We will discuss more popular ones here. We will cover three different buttons Google provides us. Below is brief detail of each button. This will help you decide which ones to place on your website. You can think of Plus One button as Facebook like button. It is a kind of recommendation of your website content on Google plus. If a visitor plus one your page then it is shared with its followers similar to what Facebook share does. It also improves time spent on your website.In this aspect it is different from Facebook counterparts. Note time spent on site is also a factor in Google Search Ranking algorithm. So anything improving your time spent of site is positive for SEO. You can think of Follow button as Twitter Follow button. If someone clicks on Follow button then that person is adding you in their circle (Google plus terminology). Whatever you share on Google Plus will be visible to that person. 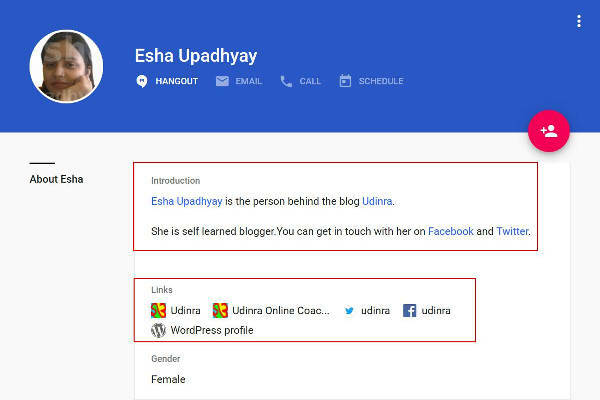 In case of personalized search if someone is following you on Google plus then your website will rank higher for that person. It is regarded as a vote up for you website by the person. So it is better to have more person following you on Google plus. Note the more relevant the person is to your field or chances of him searching about your website niche the better it is for you. Badge is similar to follow button. What is said above is applicable to Badge also. The only major difference is that badge is with your Google plus profile image. So it is rather personal decision to go with badge or follow button. Personally I prefer follow button. Follow button is less heavy than badge. It loads faster than badge. But if you feel the profile pic is important to display then you can include badge. Note displaying profile pic helps visitors connect easily. Note Google plus officially does not have comments plugin. Comments is only limited to blogger and other Google products like YouTube. But with some trick you can place Comments on your website as well. We will see later in the post how to add comments on your website. At that time we will discuss about Comments in details. How to add Google plus buttons on your website? Above we have discussed each button in details. Now you may have decided which button to put on your website. We will see different ways you can put buttons on your website. We will discuss pros and cons of each method as well. This method is applicable for all websites. It is the best way to add these buttons on your website. But this method requires customization. So if you are not comfortable making some changes then you should avoid this method. Add below line above </body> tag of your website. Note in case of WordPress this is situated in footer.php file of your theme. If you are not using WordPress then look where this tag is being generated. Now it is time to add the real buttons. The buttons get displayed where you add below code. The best places are at the end of your post content or at the beginning of your post content. In case of WordPress it is mostly single.php file or content.php file. Note for badge and follow buttons you can use Sidebars as well. But it is generally not preferred to have plus one button in sidebars. But feel free to place them as per your site needs. You can customize plus one button as per your website needs at this link. Below code can also be placed as it is. You can also get below code generated from this link. Remember to log in with Gmail account associated with the site. Only paste the part as shown below. You can create or customize the badge code as per your need using this link. Then copy the code which looks like the one shown below. This method is not applicable to all websites. I will discuss ways to add Google plus buttons on popular content management systems like WordPress , Joomla and Drupal. There will be plugins or extensions available for other platforms as well. You can use below plugins to add these buttons on your site. Note there is no plugin which helps you add all three buttons discussed above. So you will have to use two different plugins one for follow and other for plus one button. You should give visitors a reason to recommend your content on Google Plus. The best way is to offer freebies if visitor plus one your content. The only plugin which helps you implement this feature is Social Locker plugin. You can use it to boost your Google Plus presence. There are few extensions available for Joomla. You can select any one of them. Below are links to one of plugins you can use for this purpose. Drupal also has module to add Google plus button on your website. You can use below module for this purpose. 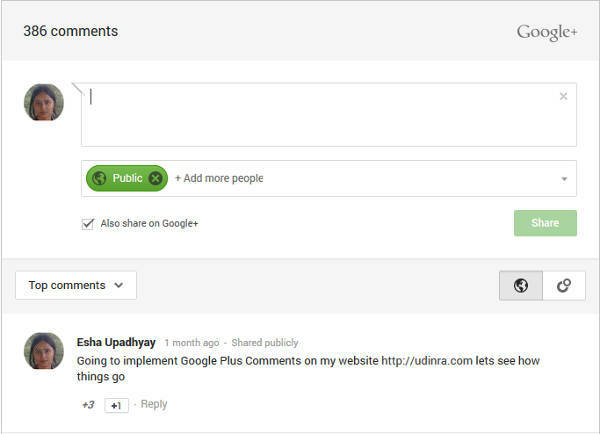 How to add Google plus comments on your website? Google announced Google plus comments on April 18th 2013 for blogger platform.You can read this post by Google for details of it.As mentioned earlier Google plus comments are not available for other platforms. But people have placed it on their site. In this section I will discuss ways to add it on your site and also pros and cons of it. There are some drawbacks as well which you need to consider before making a decision. A visitor making comments using it can share the post on Google Plus.Number of Google plus shares have positive correlation with good search engine ranking.A shared post will also bring referral traffic back to your site. A reputed profile comment and share will increase reputation of your content in eyes of Google. Comments on this platform make it easier for Google to determine quality or interactivity of the content. Google can easily get idea about interactivity of a post.Comments are measure of interactivity.Good amount of comments made using this platform Interactive and engaging post is sign of good interesting content.Good quality content is always preferred by search engines. Since it was never released by Google for other platforms there are some drawbacks. Moderating Google plus comments is also difficult.It does not have centralized moderating facility as in Facebook Comments.Visitors share their queries and experiences in comment.They expect a reply.If there is no reply then they might turn to other similar websites posting their queries.So simple easy moderation facility is important. You can not export comments made on Google plus platforms to your website. For example in your WordPress database or other CMS database. So if in future you want to get rid of Google plus comments then all your comments are lost.This is one major concern for website owners. Add below code above </body> tag of your website. Note if you have already added it for buttons then there is no need to add this piece of code again. It should only be added once. Now add below code where you want to display Google Plus comments. In case of WordPress it is generally comments.php file of your theme. Note we have explicitly set the width of comment box. You can change the width as per your theme. The comment box resizes itself on mobile devices. So it is responsive in nature. This width just signifies max width comment box can have. Only WordPress has plugin to add Google plus comments. Other content management systems like Drupal, Joomla does not have a plugin for this purpose. In case you are using WordPress and not comfortable modifying the theme files then you can use Google+ Comments.In case you want Google plus comments along with Facebook comments and WordPress Comments you can use Comments Evolved for WordPress plugin. Below image shows Google Plus Comments in action.I have logged into my Gmail account.I also have Google Plus account.If I visit a website with Google plus comments then my information will be auto populated just like Facebook Comments. It makes easier for users to comment using it. They do not have to enter details like username and email address to make a comment. How to increase Google plus presence? This is most important part. We got the site on social media. We have enabled visitors to share content on the media. But visitors need a reason to share your content. Some visitors do if the content is good and interesting. It is also beneficial to offer some eBook or other reward if a visitor shares your content on social network site. You can offer similar reward if someone plus ones your content on Google plus. I have created a plugin (Google plus to download file)specially for this purpose only. Note the plugin is for WordPress only. This is all about capturing the visitors and adding them to your social network. You should also be active on social network to gain followers from the network itself. Note there is no limit on number of followers you can have on Google plus unlike Facebook. So you should try to be as interactive as possible and increase your presence on the platform.You should try and share interesting content on communities. That will increase your exposure and you will get benefited. Google Plus is not popular like Facebook or Twitter. But it is not dead also. Integration of Google plus comments with YouTube has increased scope of this platform. Almost all of us have gmail accounts. So having a Google plus account is default. There may not be many users active on it but they have account on it. So they can easily share or interact using their gmail account if your site makes it possible. Note we all are logged into our Gmail account. So commenting on a site with Google plus comments active is not a problem. I would recommend being your site listed on Google plus and your website should have sharing button. These two things make sure your visitors can share your content on that platform. In the next tutorial we will discuss about yet other social networking site. So stay tuned. Consider sharing this post in case you found it useful.